Coming to Europe with a clear mission. If there ever was a high-performance sedan from Lexus that could pose a serious challenge to the BMW M5, the 2016 GS F is it. Making its European debut here in Geneva (after bowing in Detroit), the GS F certainly has the styling and attitude to go head-to-head with the best Germany has to offer, but what about under the hood? 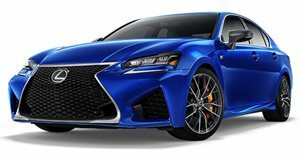 Lexus claims it’s got this department covered with a naturally-aspirated (hint BMW and Mercedes, no turbos) 5.0-liter V8 capable of producing up to 467 hp and 389 lb-ft of torque. The only gearbox that’ll be on offer is an eight-speed automatic with paddle shifters. Speaking with Lexus sources on the showroom floor, they’re confident enthusiasts will be won over by the GS F for a number of reasons. Aside from the choice of engine, Lexus engineers tuned the sedan’s suspension at both Fuji Speedway and the famed Nurburgring. Combined with a torque vectoring differential and two electro-mechanical clutch packs, it’s safe to say the new GS F is ready for a fight. Lexus loaned us a 467 horsepower sedan and made us put down our glass of BMW Kool-Aid.